Jenny is a member of the Oglala Sioux Tribe. She grew up on the Pine Ridge Reservation in South Dakota. While her husband repaired a Christian woman’s home, Jenny sat in the car cried out to God. “You know I’m not in a good place. I’m not a good mom. I don’t have money. How is this going to work? And so, I prayed to God that day for money, and I prayed, I prayed. I’ve never prayed like that before in my life. I just prayed. After that prayer, the Christian woman had come home from work and she asked me why I was crying. So, I shared with her where I was that day. I was feeling bad about being a mom and we didn’t have any money. The Christian woman said ‘You know what Jenny, don’t worry about it. I have about $300 that I can give you right now.’ And so, she took me and my husband to go eat and she gave us the money and I thought, God answers prayer." The next day, Jenny went to church with the woman. What she heard that day, gave her newfound hope that her life could change for the better. “There was a man on the stage. And I remember him saying, ‘Do you want to quit drinking? Do you want to quit smoking? Because God has a plan, Jesus has a plan for you.’ God knew how many times I would sit in my bathroom and cry because I didn't want to drink, I didn't want to smoke, but I didn't have the power to quit on my own. I walked into the middle of the aisle and I started to walk forward. I just remember saying, "I'm so sorry that I hurt you, God, I am so sorry that I did the things that I did. I'm sorry. Will you forgive me? And I felt like there was this big burden lifted off my shoulders and when I got up it was gone. You know, I was about to lose my marriage. I had lost my kids. I didn’t know where I was going. But then I met God. I met Jesus and he began to restore my life that day. And so, I walked out of that church a different woman.” She’s been sober ever since. “I went to a friend's house where they were waiting for me to get high with them, to smoke weed with them. And I remember telling them ‘I don’t need weed anymore, I got Jesus." 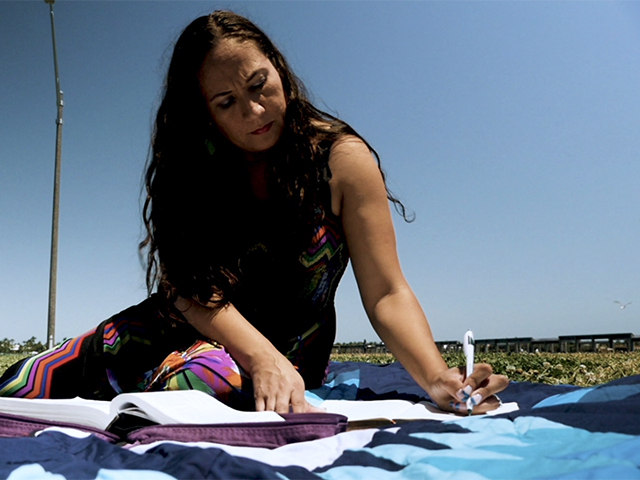 Jenny’s passion is inspiring and mentoring women, especially those who live on reservations. she speaks to people around the country and shares her story of healing, hope, and salvation. “My name is Jenny Andrews. I'm the daughter of Herb Big Crow and ‘Nicoleen Crazy Thunder.’ Jenny is a member of the Oglala Sioux Tribe.